Things look bad for Han when Boba Fett joins Darth Vader in the carbonite chamber! Exceptional artwork inspired by The Empire Strikes Back. 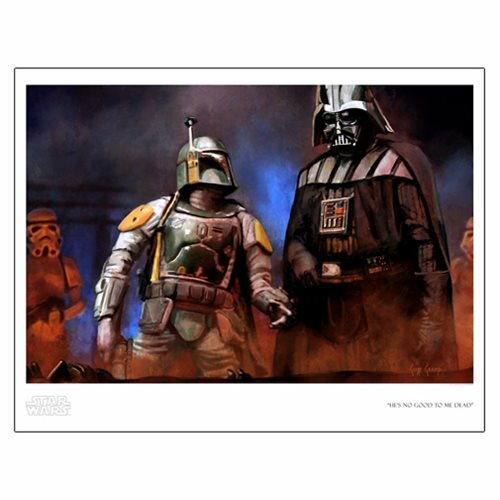 Things look bad for Han Solo when Boba Fett joins Darth Vader in the carbonite chamber in the Cloud City above Bespin in this exceptional Star Wars He's No Good to Me Dead by Cliff Cramp Paper Giclee Art Print! He's No Good to Me Dead by Cliff Cramp features artwork inspired by The Empire Strikes Back. An unframed limited edition of only 150 hand-numbered pieces, it measures 22-inches wide x 17-inches tall (image size 21-inches x 14-inches). Each paper print comes with a certificate of authenticity.